He’s spent more than 40 years on the federal bench in Georgia, but Judge Harold Murphy’s most important decision may be the one he wrote for the Northern District of Alabama over desegregation in higher education. 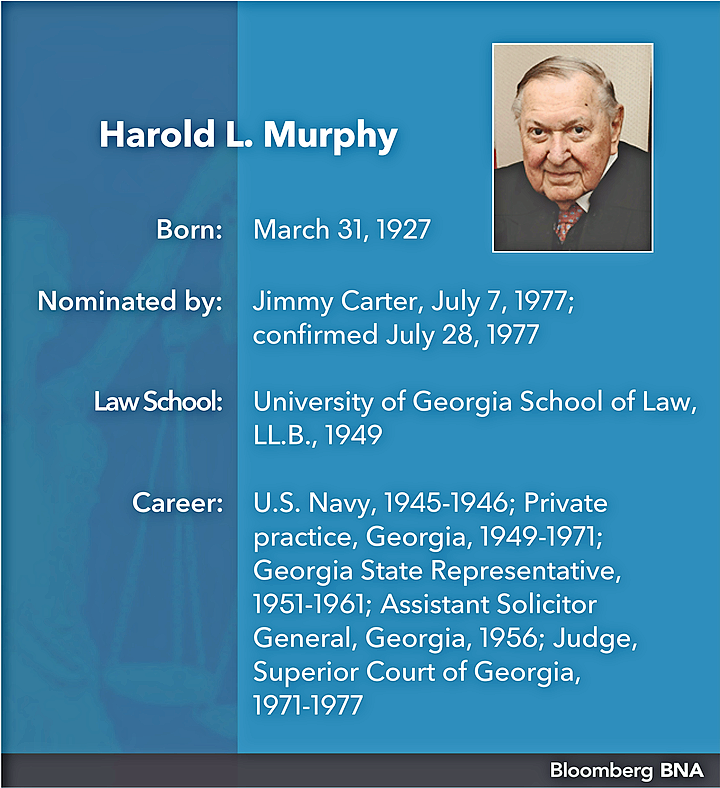 Born in a small Georgia town of about 200 people, Murphy went on to serve in the state’s legislature for 10 years alongside future President Jimmy Carter, who later nominated Murphy to judgeships as governor and as president. On his 90th birthday in March, Murphy—a Navy veteran who was in boot camp as World War II was ending—took senior status at the U.S. District Court for the Northern District of Georgia. 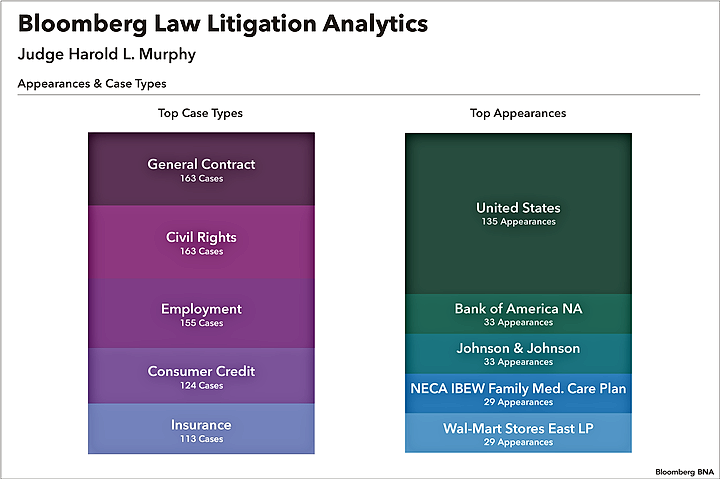 “There are so many judges I see who seem to distrust” lawyers, and that’s “the exact opposite” of Murphy, former clerk Don Samuel of Garland, Samuel & Loeb, Atlanta, told Bloomberg BNA. Though Murphy is a tough sentencer, “I put him in the camp of the more liberal-type judge when it comes to criminal cases,” Samuel, who practices criminal law, said. President Donald Trump in July nominated Georgia Court of Appeals Judge William M. Ray II to replace Murphy, who is currently the only judge who sits in the district’s Rome, Ga., location. The judge didn’t respond to a request for an interview. Murphy’s decision requiring Alabama to remedy vestiges of segregation in its colleges is “by far the biggest” of the judge’s career, Tisinger said. Murphy was appointed to hear a dispute at the Northern District of Alabama over whether the state needed to remedy segregation in its colleges, after other judges in the state were disqualified, Tisinger said. Several “remaining vestiges of segregation” in Alabama’s higher education system violated the 14th Amendment, Murphy’s 1991 decision in Knight v. Alabama said. Those vestiges were apparent in the unequal facilities of the state’s historically black universities, Murphy said. “These vestiges are a direct result of the failure of the state in the past to fund the capital development of its predominately black schools,” he said. The remnants of segregation were also visible in Alabama’s higher education employment, admissions, and funding policies, he said. “The order I wrote was 1,000 pages long,” and “I presided over the case for about 15 years” after issuing it, Murphy said in a 2008 interview with the University of Georgia, his alma mater for law school. Knight had a “profound impact on the higher education system in Alabama,” Tisinger said. Murphy’s former clerks wrote letters to him for his 90th birthday, former clerk Jeffrey Fisher of Kilpatrick Townsend & Stockton LLP, Atlanta, told Bloomberg BNA by email. “I always admired your insistence on treating everyone around you with respect and dignity,” Fisher’s letter said. Murphy demonstrated his “ability to balance justice and empathy” in a 2012 decision in favor of a school sued over a teen student’s suicide, Long v. Murray Cty. Sch. Dist., Fisher said. Tyler Lee Long, a Georgia high school student diagnosed with Asperger’s Syndrome, committed suicide in 2009, the Northern District of Georgia’s decision by Murphy said. “ Bully,” a 2012 documentary, depicted the events leading up to Long’s suicide and its aftermath. His parents sued the high school’s principal and its school district under the Americans with Disabilities Act, the court said. Long’s parents alleged that the defendants’ "failure to intervene, investigate, correct, or train their employees to adequately protect” him from bullying led to his suicide, Murphy said. “This is an emotionally charged case with very difficult facts,” Murphy said. There was little doubt that Long was severely bullied, and that the defendants “should have done more to stop the harassment,” he said. But the defendants addressed each incident of harassment reported to them, “and implemented anti-bullying programs and policies,” he said. The parents therefore failed to meet the “difficult, exacting standard” of “deliberate indifference” required by the ADA, he said. Murphy is known for his fairness toward criminal defendants, his clerks say. “At least once a month we would get a letter from somebody he sentenced,” thanking “the judge for how he treated them,” Tisinger remembered. Some send Murphy a Christmas card every year, the judge said in 2008. Murphy used to be a criminal defense attorney and “absolutely believes in the rights of criminal defendants,” Samuel said. “He’s not shy about telling the government when they’ve overstepped their bounds,” Samuel said. Murphy has done so in “dozens of opinions over the years and certainly when I was there,” Samuel said. The judge in 2016 issued a preliminary injunction stopping a Georgia city from detaining indigents arrested for misdemeanors—who would be eligible for release except for their inability to pay bail—in a class action, Walker v. City of Calhoun. “Attempting to incarcerate or to continue incarceration of an individual because of the individual’s inability to pay a fine or fee is impermissible” under the 14th Amendment’s equal protection clause, Murphy wrote. “This is especially true where the individual being detained is a pretrial detainee who has not yet been found guilty of a crime,” he said. 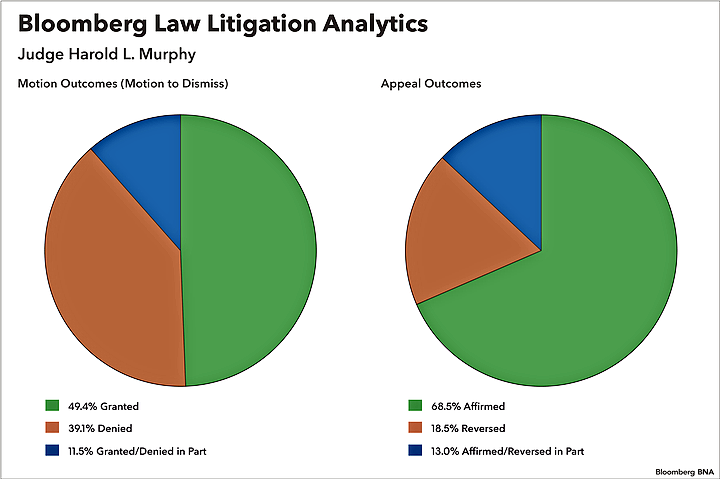 Last week, Murphy stayed the case pending an appeal to the U.S. Court of Appeals for the Eleventh Circuit.